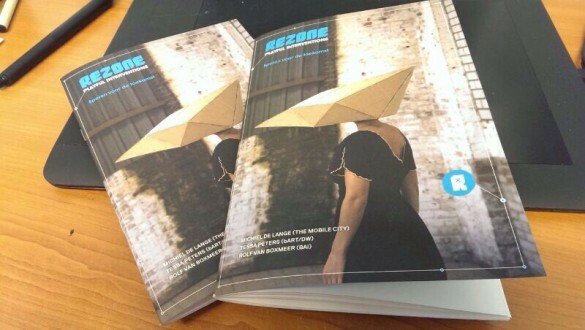 Last year, The Mobile City partnered in the project “Rezone Playful Interventions” about the use of playful design strategies to repurpose vacant spaces. In this project three teams composed of an architect and a game studio collaborated and created a temporary playful urban intervention for a near-vacant factory at the edge of the city center of Den Bosch. The three teams were: Maurer United x Marieke Verbiesen, DUS Architects x Monobanda, ZUS Architects x Fourcelabs. The DUS Architects x Monobanda intervention has also been part of our recent project “Made By Us“. These interventions could be played during a public festival and aimed to engage visitors and stakeholders with the particular location, the general issue of abandoned postindustrial heritage, and strengthen their sense of ‘ownership’. 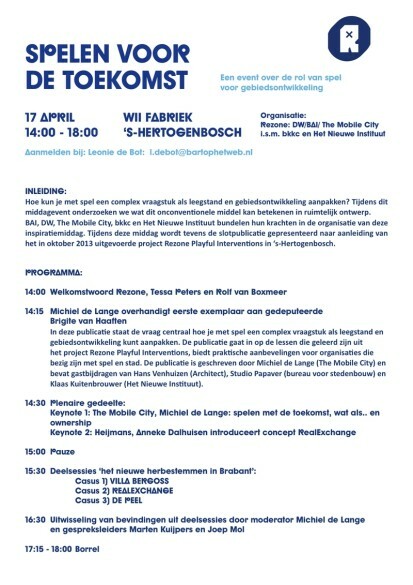 To conclude the project, a small event (in Dutch) is scheduled on April 17 14:00 – 18:00 in Willem II Fabriek, Den Bosch. During the event Michiel de Lange (The Mobile City) and Anneke Dalhuizen (Heijmans) will talk about the role of play and games in urban redevelopment and design. In breakout sessions the potential of play and games is further investigated on three levels: the scale of the building, the neighborhood, and the wider urban/rural area. In addition, the publication “Rezone Playful Interventions: spelen voor de toekomst” (playing for the future) will be presented to the provincial deputy Brigite van Haaften. The publication is written by Michiel de Lange, Tessa Peters and Rolf van Boxmeer, and contains guest contributions by Hans Venhuizen (architect and “game urbanist”), Zineb Seghrouchni and Anne Seghers from Studio Papaver (urban design studio, initiators alternate reality game “Leve de Krimp!”), and Klaas Kuitenbrouwer (Het Nieuwe Instituut, initiator “Shared Space”, a series of meeting between architects and game-developers). The publication will be published on this website after the event. Partners in the event are Digitale Werkplaats/bArt, BAI, bkkc, Het Nieuwe Instituut, and The Mobile City.